The start-up created by the students of Bandini Technical Secondary School which specializes in business management, and Monna Agnese Biological Secondary School already has a name, Isletech Ltd., a logo, an investment plan, an office and a core business: research and production of recombinant insulin for curing diabetes. 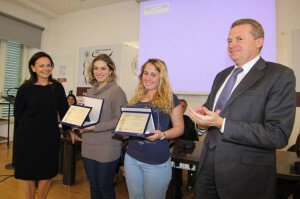 The final step of the “Sciences+Economy=Company” Project, promoted by the Toscana Life Sciences Foundation and backed by the Chamber of Commerce of Siena, took place today, Tuesday 13 May, in the CCIAA building, with the presentation of virtual biotech companies, and the awarding of the students. The six-month educational period was spread out among in-class meetings and discussions, lessons given by professionals, and visits to the TSL Laboratories and Eli Lilly Italia factory in Sesto Fiorentino. Mirella Cocco (Bandini), CEO, and Claudia Resca (Monna Agnese), head of the Isletech laboratory, have illustrated both the scientific and administrative, accounting and managerial aspects of the business. The various training steps involved the TLS staff in the incubation process, the creation of the business plan and laboratory set up; VisMederi, in a lesson on Quality Control Management held by Chiara Gentile. Quality Assurance Manager and SienaBiografix, in the scientific aspects and the web animation of the www.scienzeeeconomia.org website; the Chamber of Commerce, in accessing incentives and European funding; ChiantiBanca, in explaining financial opportunities reserved for start-ups and Eli Lilly, which open the doors to the largest factory used for the production of drugs from biotechnology in Italy, used for producing insulin from recombinant DNA for European and non-European countries.